With rise in construction activities in Maldives , the demand for rock boulders along with stone aggregates and other construction material has increased. Most of the rock boulders and other construction material is transported by sea route from India to Maldives. The rock boulders of various dimensions mainly possessing the weight ranging from 600 Kg to 1000 Kg sourced from various stone quarries. At present barges with low draft are considered for transporting rock boulders to Maldives due to the unloading points located at shallow waters. 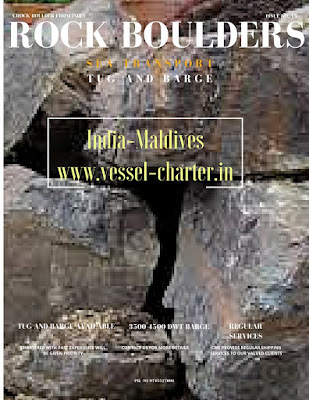 Barges of carrying capacity ranging from 2000 DWT to 3500 DWT are provided on time charter for transporting the rock boulders and other construction material to Maldives. The operating from in India are mainly from Tuticorin and other are Mangalore, Kakinada kannur etc. The port of Tuticorin located at south India is more preferred by suppliers of India to transport rock boulders in love draft bates to Maldives.